Her death is a warning: It could happen here. University Hospital, Galway, where this shameful event took place, isn’t a Catholic hospital, but no matter: Ireland’s abortion law is Catholic law. Could there be a clearer demonstration that when you get right down to it, the church does not value women, and neither does Ireland? Even a dying fetus counted for more than the life of this young, vibrant woman. Ah, but, you say, the Irish abortion ban has an exception to save a woman’s life. Not exactly. In 1992, the government tried to bar a 14-year-old girl raped by a neighbor from traveling with her parents to Britain for an abortion. The case went to the Supreme Court, which decided that abortion was legal when the pregnancy is a “real and substantial risk to the mother’s life,” and that this included suicide, which the girl in this case had threatened. The government was supposed to re-examine its abortion law, but why make waves? Twenty years later, the original law still stands. In effect, this means a doctor who performs an abortion to save a patient’s life could be arrested and required to prove that his judgment was correct at trial. It takes a brave doctor, one confident of his medical judgment, to take this risk. The bishop of the diocese of Phoenix forced the resignation of hospital administrator Sister Margaret McBride and then excommunicated her, after she OK’d a medically necessary abortion at St. Joseph’s in 2010. If McBride had been on vacation, would someone else have stepped up to the plate? When pregnancy kills a woman, her fetus dies, too. So what is the point of denying a life-saving abortion except to underline that she is the vessel, and the fetus is the human being? Anti-choice apologists don’t like to put it so bluntly. Instead they say that modern medicine means abortion is never necessary to save a woman’s life. The church likes to point to its own exceptions: the termination of a pregnancy is acceptable if it is the indirect result of a life-saving medical procedure, such as removing a fallopian tube that contains an ectopic pregnancy or removing a cancerous pregnant womb (but not, nota bene, the removal of an ectopic pregnancy directly, by medications, or by surgery that removes the embryo and preserves the tube and the woman’s fertility. That would be immoral). Even these exceptions were hotly debated until the 1930s, as Italian Ob/Gyns begged the church for guidance that would let them save women’s lives in these medical emergencies when no baby could ever result. 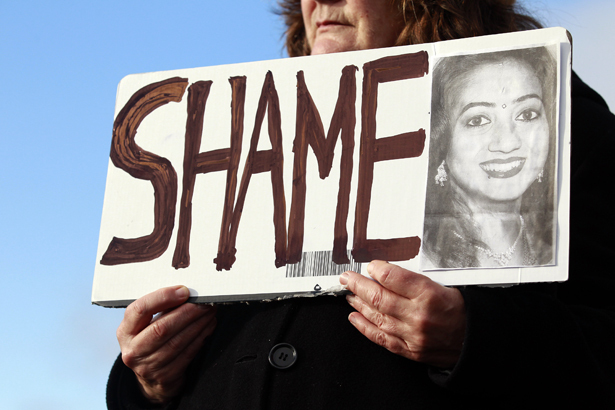 Anti-choicers would like to portray Savita’s death as simple malpractice. On blogs and social media, alternate explanations fly round: she should have been given antibiotics sooner; she would have died anyway. But nothing can change the fact that the standard of care is to remove the fetus to prevent infection. And nothing can change the fact that Savita Halappanavar is dead. With pressure mounting—an international day of protest is called for November 21—Ireland may make some gestures toward clarifying its guidelines for medical professionals to help them decide what constitutes a life-threatening situation. But a technical fix like that isn’t what Irish women need. Abortion bans are simply incompatible with women’s health. Here in the United States, restrictive laws and policies are putting women in danger. According to a report for the National Women’s Law Center, women at Catholic-affiliated hospitals, which follow the official Ethical and Religious Directives for Catholic Health Services, have been denied immediate and standard treatment for miscarriages and ectopic pregnancies. Expanded conscience clauses, and proposals like Ohio’s “heartbeat bill,” will only increase women’s risk. The next Savita could be right here at home. In her last column, Katha Pollitt wrote that the deepest division between the candidates in the just-past presidential election “was over whether, as President Obama put it, we are all in this together.